Triple negative breast cancer (TNBC) comprises approximately 15-20% of all breast cancers. The aggressive TNBC tumors are treated with chemotherapy drugs such as Taxol®, but some patients with specific types of TNBC do not respond to their drugs outright or relapse after remission. Dr. Horwitz is a molecular pharmacologist who studies how drugs work in the body. She is the scientist who discovered how Taxol works inside cells to halt cell division. Finding new anti-cancer treatments and approaches to stop resistance is Dr. Horwitz’ scientific passion. Dr. Horwitz is collaborating with other scientists, including NFCR-funded scientist Dr. Amos B. Smith, III to develop new drugs to overcome the drug resistance problem. The new drugs are hybrid molecules containing active segments of Taxol and another drug called discodermolide. These hybrid molecules will have an increased affinity to the cancer targets and reduced risk of drug resistance as well as toxicity. Two candidate molecules have been identified and tested, and the results were very promising. These candidate molecules will be further tested to evaluate their efficacy and toxicity on complex tumor models. Besides breast cancer, Taxol is also widely used for treating patients with ovarian and lung cancer. The new hybrid molecules developed by Drs. Horwitz and Smith may help improve treatment of these cancers as well. In addition to the hybrid drug research, Dr. Horwitz’s team is making significant strides in their Taxol drug resistance research. The beta tubulin protein is Taxol’s cellular target that Dr. Horwitz discovered. It’s a complicated protein because there are eight different tubulin subtypes and Dr. Horwitz found the response or resistance to Taxol may depend on these subtypes. Her team recently obtained sufficient amounts of one of these subtypes – beta-III tubulin – and were able to show, for the first time, that Taxol binds less to this tubulin type and that it may contribute to drug resistance. The researchers are now isolating adequate amounts of all tubulin subtypes, following the methodology used for beta-III tubulin, to determine how Taxol interacts with each one individually. These results may help predict which patients would respond to Taxol and the patients that would not respond well could be spared unpleasant side effects. Susan Band Horwitz, Ph.D., is a Distinguished Professor at the Albert Einstein College of Medicine. She is also the co-chair of the Department of Molecular Pharmacology and the Rose C. Falkenstein Chair in Cancer Research. Dr. Horwitz grew up in Boston, went to Bryn Mawr College and received her Ph.D. in Biochemistry from Brandeis University. Dr. Horwitz worked as a postdoctoral fellow at Tufts University’s Medical School and at Emory University’s School of Medicine. In 1967, she began work at the Albert Einstein College of Medicine. Dr. Horwitz’s key interest is finding cancer treatments using natural products as a source for new drugs. 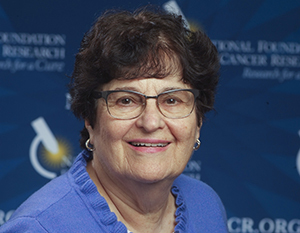 Over the course of her career, Dr. Horwitz’s work has been published over 250 times, and she has been awarded the C. Chester Stock Award from Memorial Sloan Kettering Cancer Center, the Warren Alpert Foundation Prize from Harvard Medical School, the Bristol-Myers Squibb Award for Distinguished Achievement in Cancer Research, the American Cancer Society’s Medal of Honor and the AACR Award for Lifetime Achievement in Cancer Research. Your ticket for the: Susan B. Horwitz, Ph.D.